Paisley is our newest addition to the sorority. 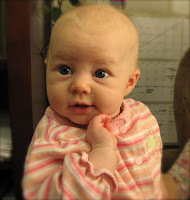 She was born February 2, 2008 and weighed in at 8 lbs 5 oz, an was 21 inches long. At her 4 month visit last week she was up to 13 lbs (33 %ile) and 26 inches (86 %ile). She cut her first bottom tooth about 10 days ago, and its' neighbor poked through just today. I hardly even knew they were coming--she wasn't even fussy about it. She has been chewing on everything she can get her little hands on, however. She has been a great sleeper from early on and generally sleeps 8-10 hours a night, from at least 10 pm to 6 am, then she usually goes right back to sleep for a couple more hours. She smiles and laughs and can roll over both ways. She has discovered her voice and is prone to squealing when she wants some attention. She likes to be carried around on my front in the Baby Bjorn pack. She doesn't really love being in her carseat, which, unfortunately for her, she is quite a bit while we run the other girls to their various activities. She is a sweet baby and we're glad to have her in our family. Love to Paisley. PS...that says Abby...but it's really from Emily Hardman. I am on my roommate computer and it automatically does that. Ooops. You have the cutest girls! They all have such darling personalities. It was really fun to spend the weekend with all of you.